The Minister for Communications, Energy and Natural Resources, Pat Rabbitte, T.D., is expected to announce a new broadcasting strategy, the news comes after the BAI's Report into the "Prospects for a Commercial DTT in Ireland? ", which stated that the Digital Terrestrial Platform gave little diversity outside RTÉ channels. The new broadcasting strategy is to build on the current Broadcasting Act but will lead to new legislation in the future, which will incorporate the new Broadcasting charge as announced by the minister in 2013. It is expect that the Minister and his department are keen to push new services on to the DTT network, particularly the Oirechtas TV channel and the Irish Film Board Channel. The new strategy is expect to be rolled out in conjunction with both public and private broadcasters. TV3 is to be advised that it can operate new services, which are expected to be in line with their 2011 Expression of Interest. These new channels include a part-time children's channel and a part-time archive channel, along with TV3+1 and TV3HD. TV3 have yet to comment on the developments. RTÉ is to continue with the services it currently provides, however it is expected that the minister will ask RTÉ to drop RTÉ ONE +1 for a mixed service called RTÉ Plus. It is also expected that he will ask RTÉ to consider rolling out a separate TV service for school going children, TRTÉ. In the meantime it is expected that the department will give the go ahead for the move of RTÉjr from RTÉ TWO, it had previously been reported that this would not be allowed. The move of TRTÉ from RTÉ TWO will happen in 2015 if RTÉ choose to develop such a channel. RTÉ have been unavailable for comment on the plans, however RTÉ’s Director General did outline plans for new internet television channels in the coming years. The Department also wishes to see a new Irish language children's service from TG4. Recently TG4 was award €1.7million for the role out of a HD service, which is currently only available on UPC and E-Vision, the Department wants to see this channel available on Saorview by the beginning of the 3rd quarter. It is expect that a +1 channel will also be given the go ahead. It is expected that the Department for Communications and the Department for Culture will work together to provide funding for the Irish Film Board Channel, which was set up as part of the Broadcasting Act 2009. It is hoped that the service will begin broadcasting by September 2014. The House of the Oirechtas are also working with 2rn (RTÉ's Transmission company) to provide Oirechtas TV on Saorview. 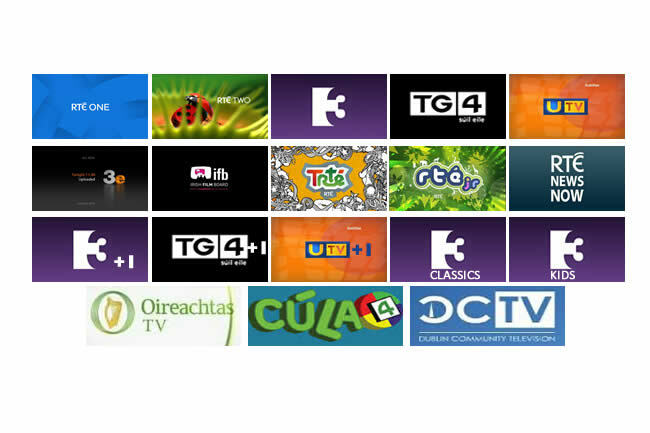 Oireachtas TV is expected to start on Saorview in September 2014. The department are keen to also provide space for Community TV services as soon as possible. With the arrival of UTV in 2015 the Department is to take advice from the BAI into how UTV+1 and UTV HD could be provided on Soarview. This article was written on the 1st of April 2014.